The University API & Domains (UAD) workshop covers topics on developing API’s, implementing DevOps practices, deploying Domain of One’s Own projects, improving the use of digital identity technologies, and framing digital fluency on University campuses, This workshop is focused on addressing current issues and best practices experienced in building out conceptual models and example real-life use cases. Attendees include IT architects, educational technologists, faculty, and software engineers from many universities. – From Phil Windley’s post about the event. I spent the last two days in Salt Lake City at the University API inaugural conference. This conference is so fresh it doesn’t even have a website yet, but it does have a Twitter account. I had an awesome experience, and spent some serious time locking in and thinking about APIs, which is something I’ve been trying to do for a while. 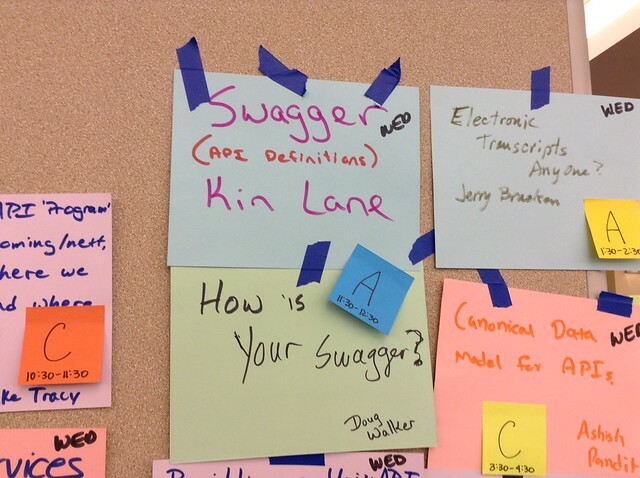 I’ll share some thoughts about this (un)conference in this post before I explore some of the ideas that surfaced and my thoughts about how APIs intersect with the work we’ve been doing with Domain of One’s Own in my next. Capiche? 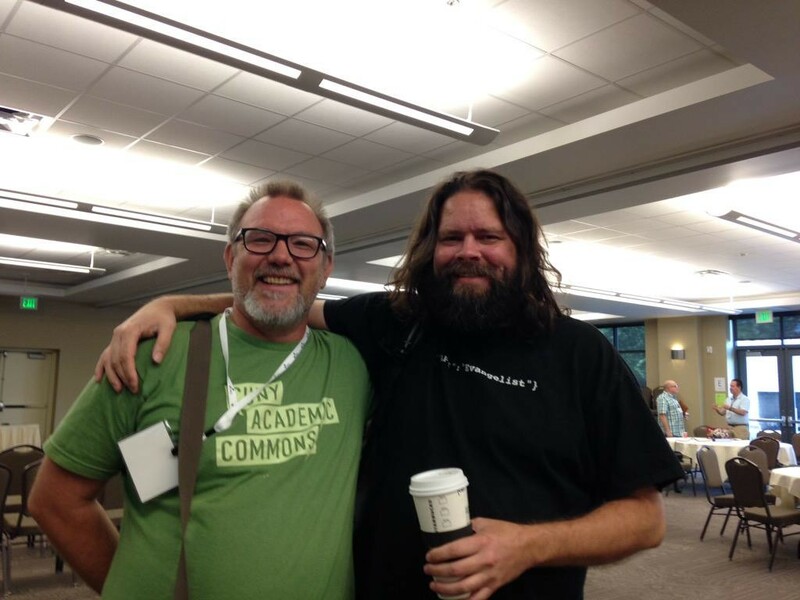 The conference was relaxed, intimate, and intense all at once–is that possible? There were only 40 people, but we had 33 sessions over two days. We got to know each other fairly well, and spent a lot of time thinking and talking about APIs, but in a low-key environment. Major props to Heidi Nobantu Saul for framing and facilitating the unconference approach beautifully. It reminded me of the 2007 Northern Voice Moose Camp, just with fewer people. A lot of serendipitous discussions, in-betweeness, and conversational sessions. I also have to give major props to Kelly Flanagan, BYU’s CIO, for creating a truly convivial and comfortable atmosphere. He’s a remarkable person, bringing a sense of humor to everything he does. But don’t let that lull you, he’s spearheading what might be the single most important development in Higher Ed IT: BYU’s thinking through and building of a University API for their campus, and beyond. This conference was BYU’s first attempt to articulate and share the vision undergirding the heads down work they’ve been doing over the last year to architect this conceptual shift. No small undertaking for what is a very large Higher Ed IT organization. For all the talk about “disruption” and “innovation” at EDUCAUSE and their IT organizational ilk, you’re always gonna find the most compelling work on the fringes. If you’re looking, I would train your eye on the work BYU is doing around the University API—it’s amazing on many levels. How do I know they’re serious about APIs and doing this the right way? Well, look who they brought to keynote…. No, not me! The API Evangelist, Kin Lane, a Mather amongst evangelists (Increase to my Cotton?). He brought the fire and brimstone Wednesday morning, inspiring hearts and blowing minds. He is legend. I could listen to him talk for days on end. SO. MUCH. KNOWLEDGE. He opened up with an overview of APIs, and why they’re the building blocks for re-imagining the ways we can collectively build the web, not to mention their implications for sharing, managing, and reclaiming one’s personal data. He then spent the rest of the morning running sessions about the future of APIs, giving an overview of Swagger, and generally being a force of good. I feel better knowing he’s out there. What’s more, he set a tone that talking about APIs is not only technical, it’s social, political, economic, educational, etc. The fact that Kelly and Phil Windley brought Kin in to frame this event speaks volumes about their approach. They have been working with Kin for a while now to help them work through the shift to making BYU’s data more accessible, malleable, and easily shared across campus via the University API. What could be more important for an IT organization? The University API conference is a space to interrogate how we create, share, and manipulate data across an institution, which means its relevant for just about anyone on campus. The problem is most people can’t get beyond the acronym API, and I totally understand that obstacle. 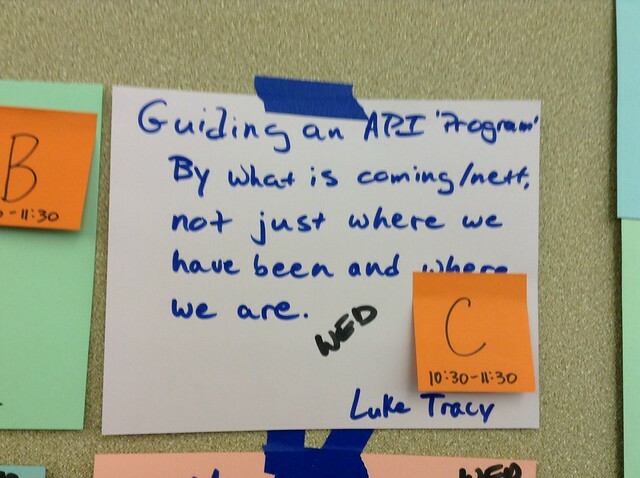 I would love it if in the next iteration we ran an API 101 track that helped folks both understand and wrap their heads around how APIs effect the whole university. This entry was posted in reclaim and tagged APIs, univapi. Bookmark the permalink. Update: I did add a more descriptive block quote of the conference from Phil Windley, who rules!